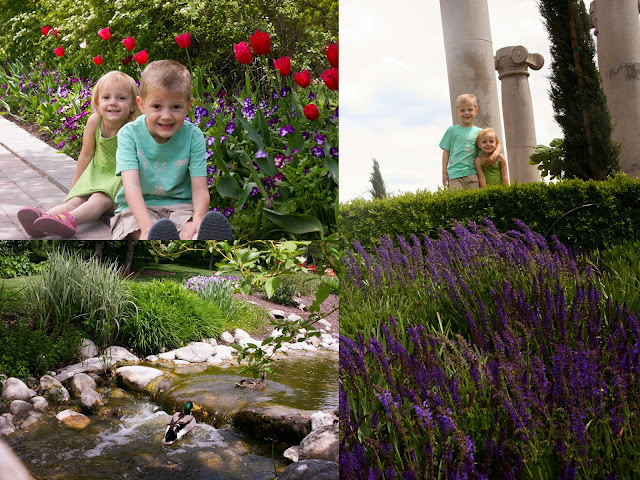 The last place for my kids and I to explore with our Thanksgiving Point membership were the gardens. We went the Monday after the Festival of Tulips was over. The place was deserted but the tulips were still in bloom. It was perfect! We returned again the following week and, although it was still really pretty, it was not nearly as impressive. The gardeners had began to remove the tulips to make room for summer plants so some areas were bare, and the tulips that were still there had begun to fade. There are 15 separate themed gardens on the property. The Vista Garden (above) are the highest point and offer a great 360 degree view of the area. 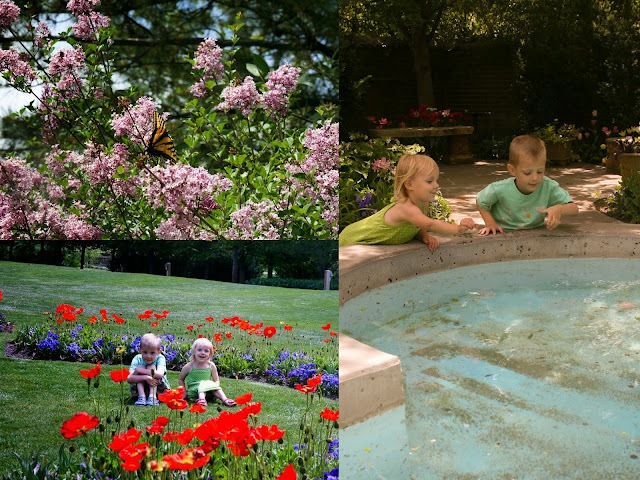 The garden is home to countless koi fish, families of duck and geese and at least one rabbit. We saw the poor little thing get chased by a group of kids on a field trip during our second visit. 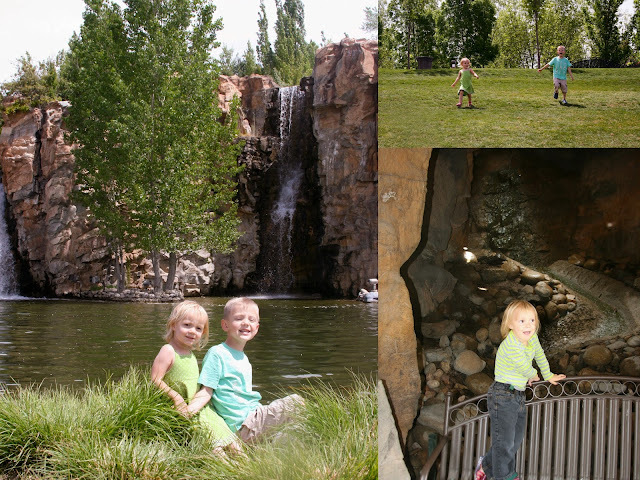 Our two favorite spots were the Secret Garden and the Waterfalls. The secret garden contains many of the elements from the one described in the children's book by the same name. Thanksgiving Point was created to offer peace and healing to those who enter. I think that the Secret Garden embodies that mission. 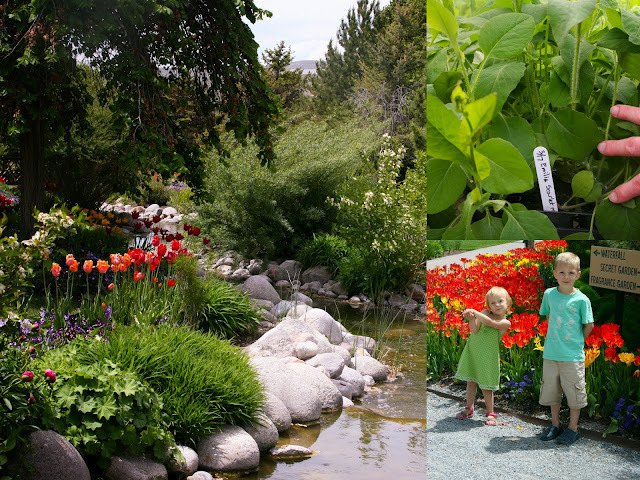 Thanksgiving Point is a place away from the craziness outside its boundaries, and the secret garden offers an additional layer of insulation from all that's outside. There are several seating areas on the outer edge of the garden with a large fountain at its center. The kids enjoyed splashing their hands in the water and throwing each a penny in it. During our first visit we got to observe a huge monarch butterfly on one of the bushes in the garden. It was the size of a small bird. Our second favorite spot are the Waterfalls. They are the largest man made waterfalls in the western hemisphere. There are actually nine of them across the rock wall. They run approximately 20,000 gallons of water per minute, but the pumps that circulate the water have the capacity to run up to 60,000 gallons per minute shooting the water as far as the center of the pond. The fun part however is actually walking across the top and getting a close up view of their magnitude. There is a spot where the kids could stick their hands through holes in the rock wall and touch the water as it fell. During my second visit I took advantage of the tulip sale they were offering. The gardens don't store and reuse their tulips from year to year. Instead, the public can buy a dozen for a minimal amount. The only drawback is that you don't get to see what you are getting. So, who knows what colors I will get next spring when they bloom. Emilia has not yet been able to visit the garden because she is in school whenever we have gone. While I was in the greenhouse buying the bulbs I spotted a plant that had her name on it. I snapped a photo of it so she would see it and know we were thinking of her.